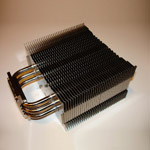 Today we are going to take a look at the latest offering from Noctua in CPU cooling. The NH-U12P is the newer version of the NH-U12 that we reviews a little while back. It has the same basic features as the NH-U12F, but is paired with the new Noctua NF-P12 120mm fan. So while we are testing the NH-U12P we will bring back the NH-U12F for a comparison. Nice review. I'm hearing lots of good things about their coolers. Good performance vs. price point. I'll probably use one of theirs on my next rig.